It is said that the single greatest driving force in life is the drive to reproduce. There is nothing more inherently important than the continuation of the species. As humans, we have almost unlimited resources for finding the perfect mate: parties, school, work, dating websites, Facebook, Myspace. Even online RPGs such as World of Warcraft have been known to bring potential soul mates together. Then once that perfect mate is discovered we have many transportation options to arrange a rendevouz. Unlike animals, we don't have to expend our metabolic energy traveling to our mate. Of course there will be some who will dispute my claim of humans having it easy when it comes to mating...but consider having to WALK thousands of miles simply for the CHANCE of finding a partner worthy of donating to the Homo sapiens gene pool. Clearly, sitting around surfing the web for your sweetheart would be preferred. Yet, some animals prefer the former method. The following list is of the most incredible journeys over land, sea, and air undertaken by animals all in the name of reproduction. The Sooty Shearwater (Puffinus griseus) is a medium-sized seabird that currently holds the record for the longest annual migration of any animal in the world. They have a life span of about 35 years. Their breeding grounds are in New Zealand and Chile but they travel from Japan and California. In order to accomplish this feat, they make giant figure eights over the Pacific Ocean traveling about 39,000 miles (65,000 km) every year (see picture below). They do all this traveling as individuals and so there really is no set community of birds. Two birds from the same nest may end up at two completely different breeding grounds. 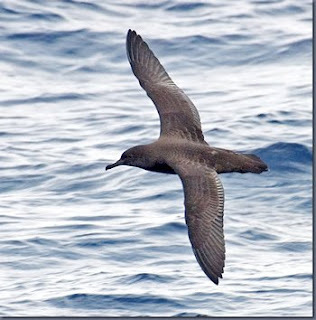 Amusingly, a group of sooty shearwaters is referred to as an "improbability" of shearwaters. breeding adults, and lastly non-breeding adults and fledglings. Migrating for the purpose of finding the choicest feeding grounds does not require a very strict time table so, flying north, all individuals cross the equator within about a month. Migrating for the purpose of reproduction is a much different story. 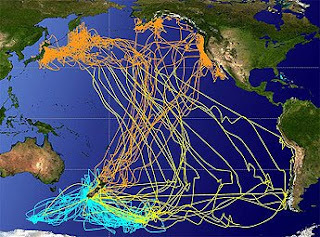 On the flight to the southern hemisphere, all birds cross the equator within 10 days. That is incredible considering there are about 20 million of them. Sooty shearwaters are colony nesters. Both parents help incubate a single egg for 7 – 8 weeks. Both feed the hatchling for almost 14 weeks and then fly out to sea and the yearly cycle continues. 2. 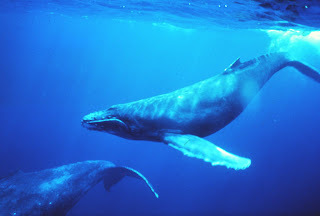 Humpback whales (Megaptera novaeangliae) are the world's farthest migrating mammals. Unfortunately, they are an endangered species with only 10,000 – 15,000 remaining in the world. There are 3 separate populations: those living in the North Pacific, North Atlantic, and the oceans of the Southern Hemisphere. A group in the South has migrated the farthest known distance from close to Antarctica to the warmer waters of the equator a distance of 5,100 miles away. The whales travel in groups which generally break apart once they reach the breeding waters. They breed in warm tropical waters during the winter and raise their calves. Male whales "sing" at the breeding grounds to attract females for mating. An adult female bears a calf every 1 – 3 years even after a gestation period of 1 year and spending around another year rearing the calf. During the time the mother is raising its child, she does not eat and lives off her blubber reserves. Once the winter breeding season is over, the whales migrate back to the poles where their main food source prospers. The whales feed using baleen plates which act as giant filters to trap thousands of fish in one gulp. Humpbacks are cooperative feeders and employ different tactics while hunting including bubble net feeding. This is accomplished by multiple whales blowing bubbles through their blowholes and forming a circle around fish that confines them to a smaller area. So the whales get more fish in their mouths for less energy. Whales consume about 4,400 – 5,500 pounds of plankton, krill, and fish every day during their feeding season (120 days). Such a large amount is necessary to build up blubber stores for the long journey to warmer waters for breeding where they won't eat for an entire season. 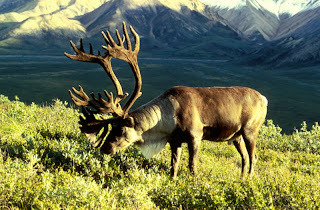 3) Caribou, or Reindeer, (Rangifer tarandus) embark on the world’s longest migrations for terrestrial mammals. Adult male lifespan is about 7 – 8 years and female lifespan is about 10 years. The species ranges all over Canada. 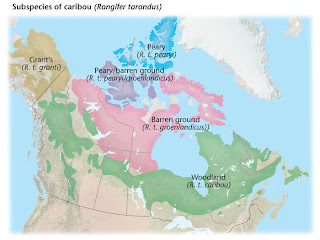 There are various herds of caribou, but the largest and most extensive migrators are members of the Porcupine Caribou herd which has about 125,000 members and travels about 1,500 miles every year between their calving grounds and winter feeding grounds. It has been recorded that they’ve migrated 3,000 miles on occasion. Their range basically covers Alaska. An interesting fact about caribou is they are the only deer where both sexes have antlers. Males shed their antlers after the fall breeding season and females shed them after the calves are born in the spring. The Porcupine herd spends winter in southeastern Alaska and sometimes within the Yukon Territory where they feed on lichen and reindeer moss until it is time for the spring migration. Their destination is the calving grounds located on the coastal plains and foothills. Mating has already occurred the previous fall. The newborn calves form a close bond to their mother and feed on her milk for about 45 days until they can graze with the other adults. The calf will stay with the mother until the next fall when she mates again and the calf becomes independent.